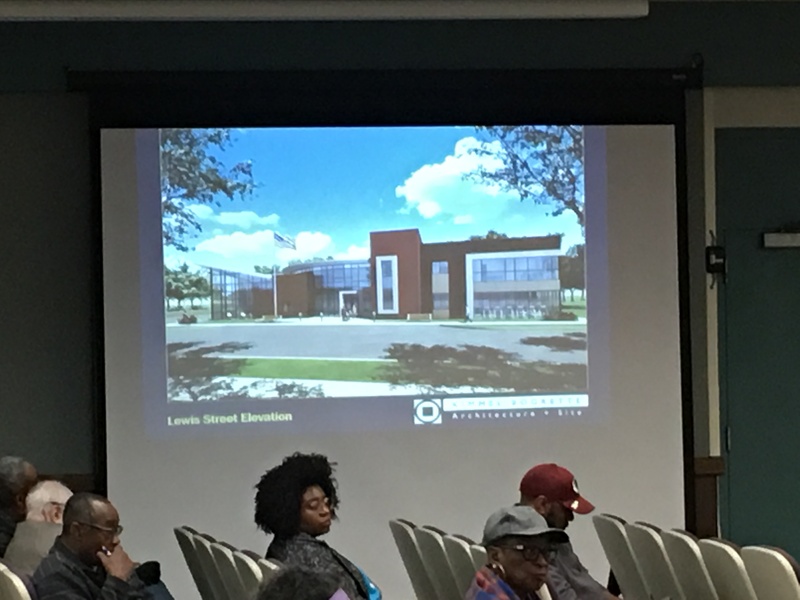 An artist’s rendering of the proposed Franklin Township Youth Center projected during the March 20 Planning Board meeting. A new library branch, a fitness center and music and video studios are just some of the amenities that will be included in the Franklin Township Youth Center when it opens on Lewis Street. The 24,000-square-foot center is slated to open in September of 2020. Under discussion for decades, and championed the last several years by Township Councilwoman Kimberly Francois (D-At Large), the two-story youth center is envisioned as a multi-use building where township youth will be “inspired to achieve,” in the words of Francois. The center’s plans were reviewed at the March 20 Planning Board meeting, during which time the board and public heard from the project’s planners and architects. The center’s plans were presented to the board so that it could certify that it fit within the township’s Master Plan. Because it is a township-sponsored project, the plan did not need Planning Board approval. “We want to inspire our youth,” she said. Saffie Kallon, the township’s special projects coordinator, said the center’s first floor would have a large teen lounge and common area where teens can socialize and do their homework. There will be a satellite branch of the public library on one end of the building, as well as space for an exercise room, a fitness center, computer stations and room for the Franklin High School video-based “Aspects” program, she said. There will also be a small outdoor patio where youth can socialize, she said. The building’s second floor will hold offices, meeting rooms and music and video rooms, she said. Programing at the center will give youths “opportunities for community service and to learn life skills,” she said. The building will “allow for a community space our youth can call their own,” she said. There will be two electric car charging stations in the center’s parking lot, and also an area for bicycle parking. In response to questions he had about light from the building affecting neighbors, Councilman Carl Wright (D-Ward 4) was told that the lights on the building will point down, and that there will be a shade system built into the windows to keep any nighttime light in the building. Township Manager Robert Vornlocker said initially it was thought the center would operate until 10 p.m,., but after a resident questioned the late hour, Vornlocker said that nothing was finalized and that closing time could be earlier. Vornlocker said the center’s proximity to Naaman Williams Park, which hosts the township’s summer program, would give children a place to go in inclement weather. Non-profit and counseling organizations will also be given office space in the center to provide programs for the youths. Vornlocker also said that some employment opportunities for township youth could be offered at the center, such as in the snack bar or at the front desk. The township’s director of economic development, Vince Dominach, said that bids for construction will go out in May, with a hopeful construction start in June. In response to questions from Wright about traffic, Vornlocker said they expect mostly destination traffic to the site, coming from certain streets, rather than “drive-by” traffic. He noted that the previous use there, the SCAP program, had a daycare center which generated more traffic than the youth center will. “No matter how great we are, someone’s going to speed down there at 9 o’clock at night,” he said. The SCAP program also had daycare and an outdoor playground, something this center will not have, Thomas said. “What you’re replacing it with is a great improvement,” he said. “This project should have been done 25 years ago, but it couldn’t have because we didn’t have the leadership of the Mayor and Councilwoman Francois,” he said. Mayor Phil Kramer, who was in the audience, said the credit for the center belongs to Francois. Township residents who spoke gave the project high marks. “I am so thrilled to have a center like this because I envision the youth of different ethnicities, different faiths coming together in such a center, playing together, learning together, helping each other, and building that strong bond so we can continue making Franklin Township a township free of hate and bigotry and having unity,” said Alex Kharazi, president of the Franklin Township Interfaith Council. “This is a wonderful place for our township,” he said.